Good organisation is key to efficient and hassle free daily filing. Using these 5-Part Concord Reinforced Subject Dividers, arranging and indexing your presentations, projects, filing and notes has never been easier. Staggered tabs separate documents into sections ideal for numbered arrangement. 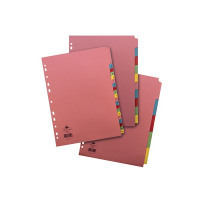 These dividers feature extra reinforcement with Mylar coated holes that resist tears and rips. With a pastel coloured finish they are punched to fit almost any ring binder or lever arch file.